The bio of George Graham White senior | Launceston Then! With special thanks to Anne Evans. He studied law in 1842 being articled to Thomas Shilson of St. Austell. In May of 1849 he was appointed to be a Master of Extraordinary in the High Court of Chancery. It is assumed that George’s reasons for coming to Cornwall was that his uncle, George Graham White, who was also a qualified lawyer, was living at Torfrey, Golant, so George came to live with him. On qualifying as a Lawyer, George moved to Launceston in 1850 to live with his sister and widowed mother at New road. In 1852 he married Francis Baynes Smith daughter of Joseph Ford Smith who had been a Surgeon in Launceston, and they set up home in Tower street, Launceston. Together they had thirteen children twelve surviving. They were Catherine S. b. 1853, Marianne E. b. 1854, George G. b. 1856, Francis E. b. 1858, John K. b.1859, Ellen S. b. 1860, Ernest J. b. 1861, Edwards G. b. 1864, Alice G. b. 1866, Annie Baynes b. 1868 (who married Dr. Charles Gordon Gibson), Arthur H. b. 1869 and Herbert E. b. 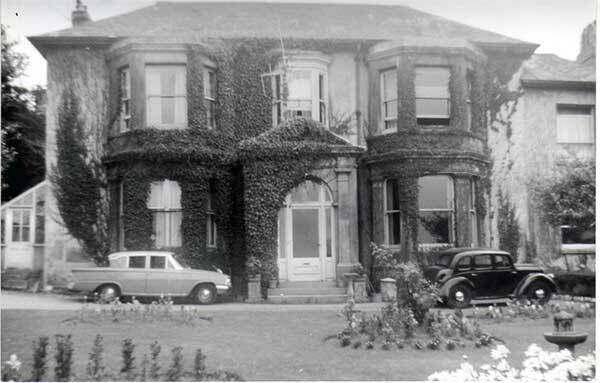 1871 and by 1871 they were living at The Walk house (below which was demolished in 1964 to make way for the Tower Street car park), Launceston, the family home of Francis who’s family had moved there in 1830. 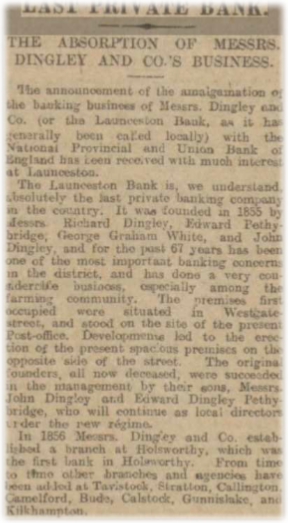 In 1855 along with Richard Dingley, Edward Pethybridge, and John Dingley he helped set up the Launceston Bank. The first premises for the bank was the site of the Post Office in Westgate street but a new building was constructed on the opposite side of the street now occupied by the Launceston Banks descendent the Natwest bank. He was elected to the town council in 1863 being elected to a Alderman in 1874. In 1865 he served his first of three terms as Launceston’s Mayor the second occasion coming in 1875 and the last in 1886. He became the Coroner for the district in 1879 after serving as the deputy Coroner for the previous two years. George died of a heart attack on the 17th of June 1889 at the age of 64. His wife Francis survived him by several years passing away on the 6th of August 1910. The family did not attempt to retain their old home. The house and a variety of other property was sold on 14 October 1910 by auction at the White Hart Hotel, the house with garage and ‘pleasure grounds’ fetching £900 from Mr J S Philips Pope of Exeter (Western Times 18 Oct 1910).